The kitchen is truly the heart of the home. It’s an activity hub that handles everything from cooking to homework to visiting with family and friends. 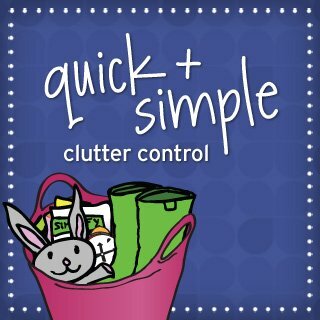 When it’s organized you’ll save time and frustration every single day! The kitchen is truly the heart of the home. It’s an activity hub that handles everything from cooking to homework to visiting with family and friends. It is a daily use, multi-tasking space. 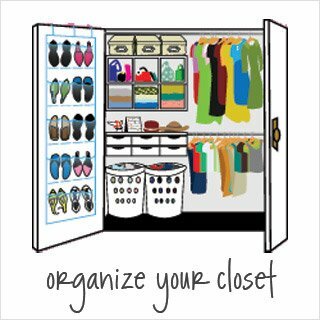 When it’s organized so it works for you and how you live, you’ll save time and frustration every single day! Save money and eat healthier. Because preparing meals is simpler, you’ll eat at home more often! Gain insider access to professional organizing techniques and strategies for a fraction of the cost of working with an organizer one-on-one. Find out how to organize your kitchen so that you’ll be able to prepare meals in less time! Waste less food because you know what you have and can use it up before it goes bad. Organize your kitchen on your time schedule in small blocks of time. The self-paced format and bite-sized lesson content makes it easy, so it’s the perfect solution if you have a busy schedule! Feel good welcoming drop-in guests into your kitchen, instead of feeling your stomach drop when the doorbell rings. Over 2 hours of how-to videos by instructor Aby Garvey, segmented into short viewing sessions. The format and concise action steps make it easy for you to incorporate the organizing ideas into your kitchen. Over twenty minutes of bonus video content, along with note pages and worksheets that make it simple to follow along and put the ideas into action. 28 pages of easy-to-implement content. Includes note pages, questionnaires, checklists and planning forms delivered as colorful, printable, and editable pdfs. You can add notes to your handouts electronically, creating a customized action plan. Lifetime access to class materials on our web site. Materials format: Video (demonstration style), and written (PDFs of note pages, questionnaires, checklists and planning forms). All materials, including the videos, are downloadable. Use the format(s) that work best for you! This is your chance to get organized for the kitchen class! 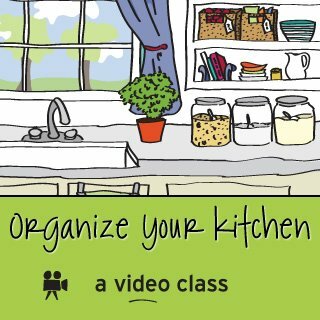 You’ll get three videos designed to help you carve out time on your calendar for the class and your kitchen organizing project, and help you collect the supplies you’ll need to organize your kitchen. Lesson: Let the Kitchen Organizing Begin! 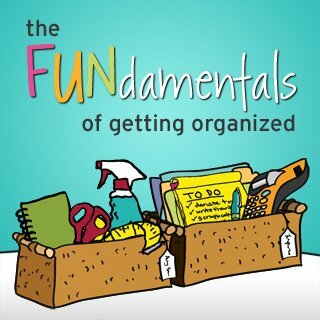 The lesson is broken down into simple-to-follow video segments that show professional organizer Aby Garvey organizing her kitchen using the process, tips and techniques she uses in her clients’ kitchens. You can immediately begin creating change in your kitchen. You’ll start with a questionnaire that will help you become clear about the changes you’d like to make in your kitchen. Then, you’ll watch along as Aby solves her kitchen dilemmas using organizing and storage solutions. Action steps, notes pages and worksheets make it easy to follow along at home and transform your kitchen into an organized, functional and inspiring place to be. You’ll also see Aby’s favorite kitchen storage solutions, as well as shopping tips to help you purchase (or repurpose) storage solutions that will solve your kitchen organizing challenges. Bonus video #1: Take a video tour of Aby’s refrigerator and freezer and learn her tips and tools for creating and maintaining order in these essential kitchen storage areas. Get simple ideas to organize your refrigerator and freezer, including how to add storage solutions to make these areas super easy to use. You’ll save time and waste less food when you put these ideas in place in your kitchen. 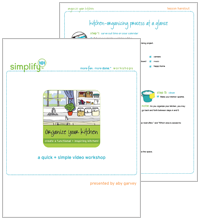 Bonus video #2: Discover how to put an end to paper clutter in your kitchen using simple, time-tested solutions. You’ll eliminate a common source of clutter in the kitchen, making your space more relaxing and easier to use. Bonus video #3: Watch as Aby shares a simple plan that will help you maintain order in your kitchen going forward. Includes bonus worksheets to help you create your own, customized kitchen organizing plan, so you continue to enjoy the ease of cooking, baking and entertaining in a clutter-free space. Please check out the introduction video from Aby (displayed on the Summary Tab). If you can view this video, you’ll be able to view the class content. If you plan to use multiple devices, such as your home computer, smartphone, iPad, etc., please check that you can view the video on all devices.